We don't play tricks with your money -- see below for instructions to cancel your Fomo subscription in seconds. Step 0 - Ecommerce store, or subscribed via Paypal? If you installed Fomo through the Shopify, BigCommerce, LightSpeed, WooCommerce, or Ecwid app marketplaces, simply delete Fomo from your ecommerce admin portal and billing will cancel immediately. If you pay for Fomo through Paypal, follow this simple guide to immediately cancel your subscription, and then email us so we can disable reminder alerts. Otherwise, if you connected Fomo by signing up at fomo.com, see below. While logged in, visit Settings (top right) > Click the Blue logo and click 'Account'. 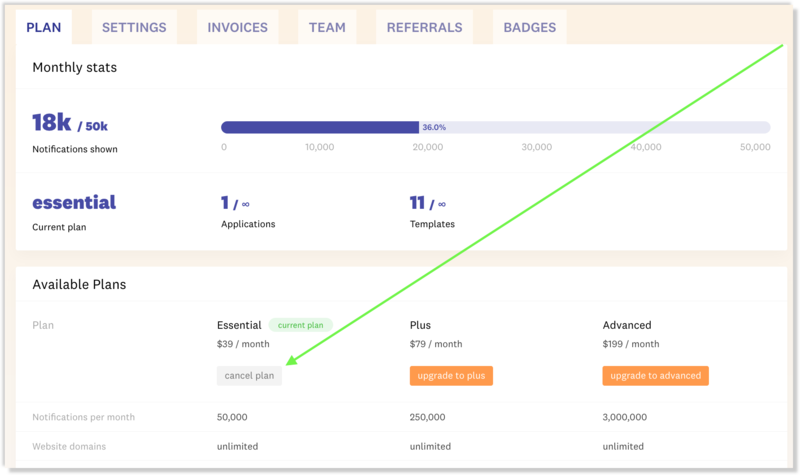 Click into the 'Plan' tab once you're inside your Account, and then scroll down a bit. You'll see something that looks like the account below, just click 'cancel plan' and your billing subscription will be cancelled immediately. Note, you must be the primary subscription owner for this to appear! If you are an invited team member, just ask the person who invited you to log in and cancel instantly. Your subscription will remain active until the final day of your billing period, but you will not be charged again. If you're willing to share why you cancelled, we'll donate $10 to a charity of your choice. Email our founder, ryan@fomo.com, a donation URL and some feedback to claim.